Easy homemade protein bars that taste just like a cinnamon roll! 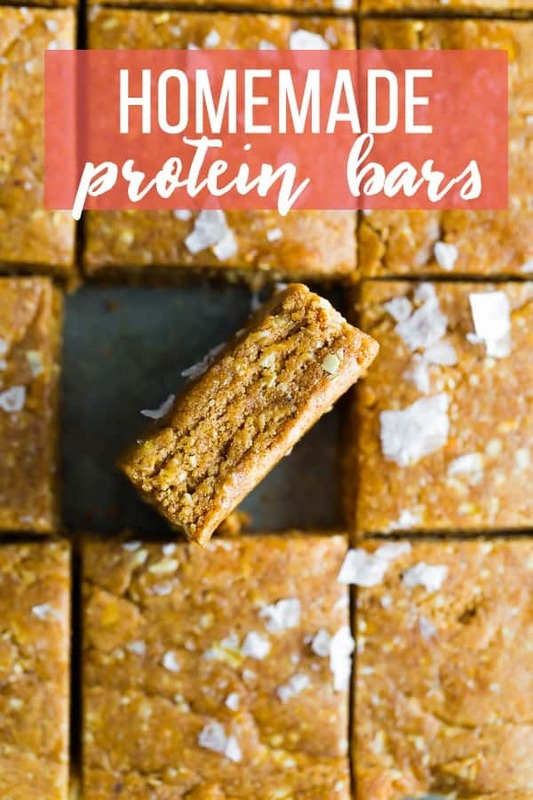 Save yourself money by making your own protein bars; they are no-bake, made with a few simple ingredients and soooo much better than store-bought! Post includes a video tutorial. Ever since baby was born, I have been hungry. Not just hungry but HUNGRY! I need protein to keep me full and have been loving protein bars to help fill me up. I’ve tried a few different brands out there…some are totally full of chemicals (not going to name names here), while others are full of real ingredients (ie: Rx bars!). The thing that they all have in common? Protein bars are expensive! Some of them are up to $4 per bar, which is pretty pricey for a snack. My solution? Let’s make homemade protein bars! I was surprised at how easy these were to prepare and not only that, but they rival pretty much any protein out there in terms of flavor. 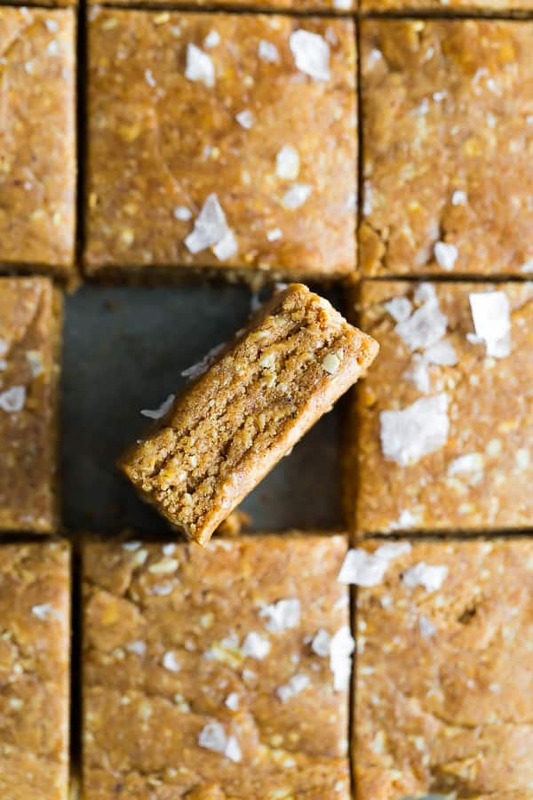 With just a few simple ingredients, you will have the BEST tasting protein bars out there! that I used for these Sheet Pan Protein Pancakes. It adds a big boost of protein (30 g), a nice vanilla flavor, and a touch of sweetness. I haven’t tested with a vegan protein powder yet. Almond butter- natural only! I have also tested with natural peanut butter but natural almond butter had a slightly better flavor. First we blend our dry ingredients in a 7 cup food processor (this is the food processor I have! ), then we add in our wet ingredients and blend. 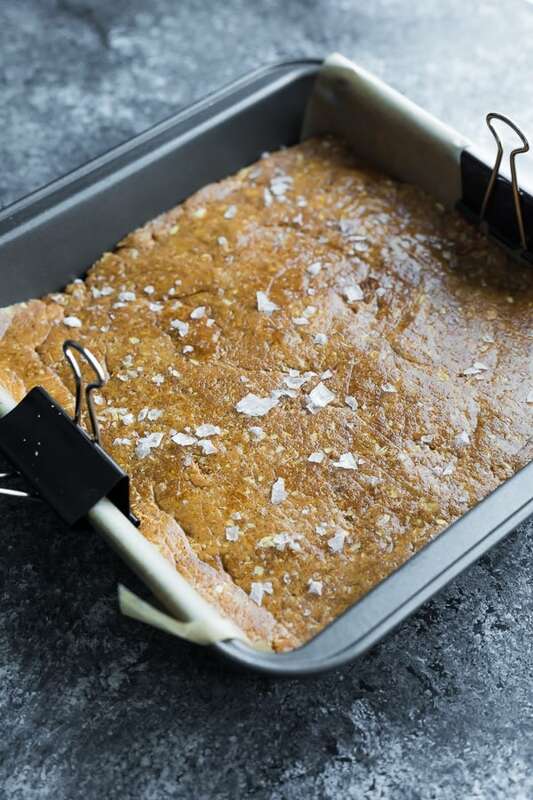 Finally, we press the bars into a prepared baking dish (line with parchment), and sprinkle with flaky sea salt. I HIGHLY recommend the sea salt, it really brings out all the cinnamon roll flavors in these homemade protein bars! A note about batch size: these photos show a double batch of the bars. I recommend sticking with a single batch of bars because they blend together a lot easier. How to store homemade protein bars? These protein bars must be stored in the fridge for up to 7 days. Because of the natural nut butter, they soften significantly at room temperature. I would even recommend freezing for longer term storage! I have tested this recipe with AllWhey French Vanilla Protein Powder; I bet it would work great with a vegan protein powder however I have not tried. 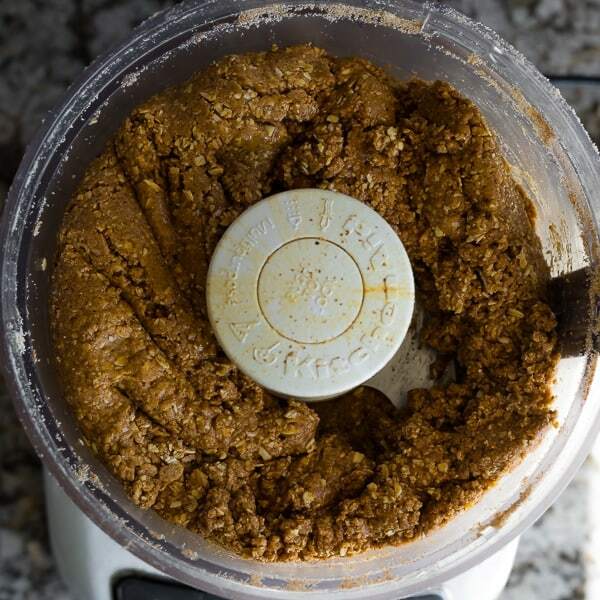 Make sure to use NATURAL nut butter; I tested with both natural almond butter and natural peanut butter. Watch the video below to see exactly how I prepped my Easy Homemade Protein Bars It’s so easy! You can find more of my recipe videos on my YouTube channel, or on Facebook. Easy homemade protein bars that taste just like a cinnamon roll! Save yourself money by making your own protein bars; they are no-bake, made with a few simple ingredients and soooo much better than store-bought! 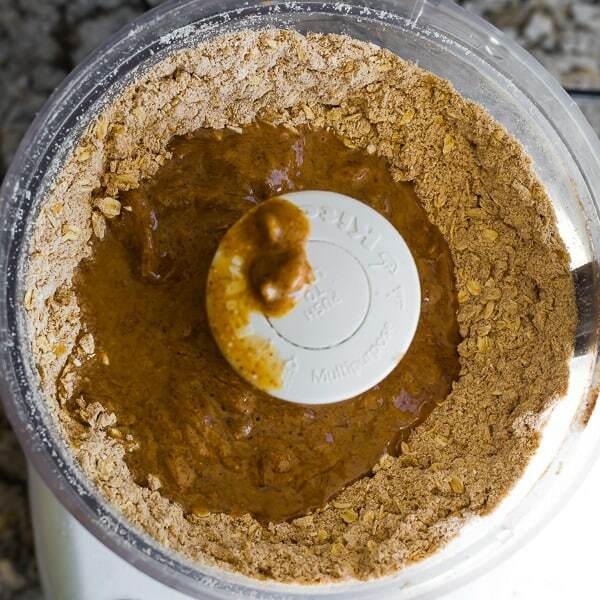 Combine the protein powder, cinnamon and rolled oats in a 7 cup food processor fitted with a steel blade. 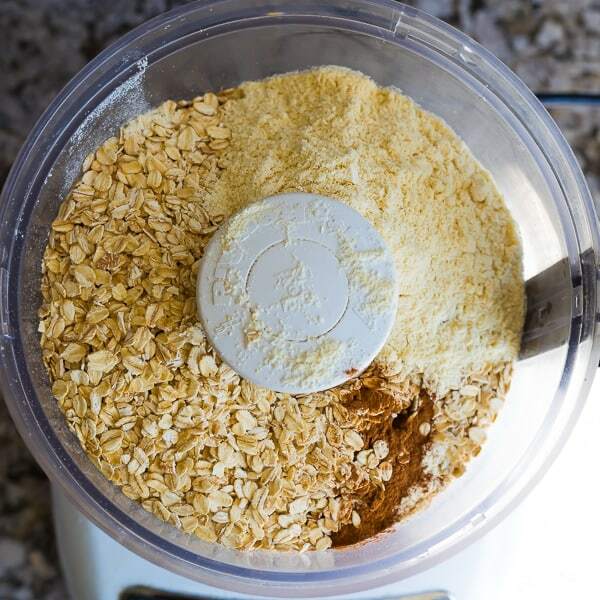 Blend until the oats are powdery and blended. In a microwave safe bowl, melt the coconut oil. Stir in the almond butter, honey and vanilla extract until smooth. Add the liquids into the food processor in two batches, processing in between. Process on high for 1-2 minutes until mixture is completely blended and mixed together. You may need to stop and press the mixture down a few times with a spatula. If mixture feels dry, add 1 tablespoon of water and process again. Line an 8 x 8 inch baking dish with parchment paper. Scoop the protein bar mixture into the pan and press firmly with a spatula. Freeze for a minimum of 30 minutes before slicing into bars. Keep bars in the fridge as they become soft at room temperature. Do you think these could work in a good blender too? My food processor is only 4 cups. Thanks! Looking forward to trying them out. Hi Tim! I haven’t tried, but if you have a good blender it may work. These are absolutely amazing! The perfect protein-packed snack! Hi 🙂 Can you recommend something to use instead of oats? 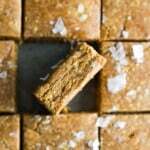 Would another gluten free flour work? Thanks! Hi Jasmine! Unfortunately I’ve only tested as written, but that’s a good idea to test an alternative flour. Hi, I am really confused about the calories listed here. I added all the calories from everything I used and divided by 6 (I cut them into 6 instead of 16), and I got around 265 calories… That’s for a piece way bigger than what yours would be. Are you sure you added correctly? Hi! You are correct, I just ran it through My Fitness Pal and got a different value…looks like one of the ingredients must have been off in the database I was using. I’ve updated the info, thanks for catching that! hi. if you put 40g of protein in this and make 16 bars, how is it that you claim 7g of protein per bar? Hi Liz, sorry for my late reply, I’ve just returned from holidays! To clarify, it’s 40 g of the protein powder, not of pure protein. And there is also protein from the other ingredients, most notably the nut butter. I also want to point out these are purely estimates…hope this helps! I don’t suppose you have any suggestions for alternatives to nut butters for this? I have a nut allergy but I’m trying to find a good protein bar recipe I can actually eat! Hi Grace! I have only tried it with almond or peanut butter, but I bet sunflower seed butter would work! 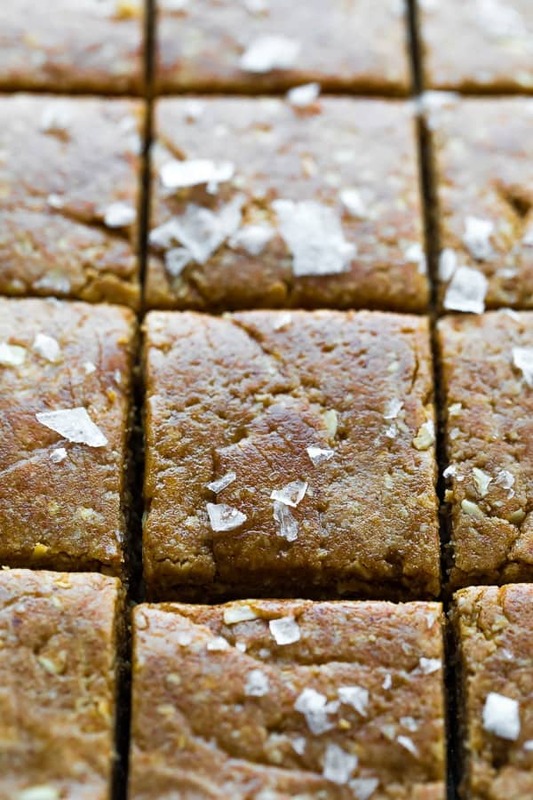 Alternatively you could try a date-based recipe (like this https://sweetpeasandsaffron.com/nut-free-energy-bites-seed-free-coconut-free-option/) and try adding protein powder to it. But I haven’t tried that so I can’t say 100% how it would turn out. I hope this helps! I don’t have a protein powder? Is there any substitute for that? These look awesome! I can’t wait to try them out. Have you heard anything about eating protein powders during pregnancy or breastfeeding? All the labels have a “warning” but I can’t find any info good or bad. Thanks! Hi Caira, No, I haven’t heard anything…and I should probably know because I’m nursing my baby right now! I don’t consume any large quantities, but if you were to, I’d check with a doctor. I just made these, they’re so good! Thank you for all of your great recipes. I’ve made several and enjoy them so much!